For various reasons on the AP Roofing! sites, you may be requested to submit personal information to better serve you. Your privacy is very important to us, and we have the highest respect for the confidentiality of your personal information. We never sell or rent your personal information to any third party under any circumstances. We value your trust and will work to protect the security and privacy of any personal information you provide to us. This notice applies to all information collected or submitted on the AP Roofing! website. On some pages, you can inquire about products, make requests, and register for various services or receipt of materials. The times of personal information collected at these pages are expressly identified and entered by you. Take the first step today! 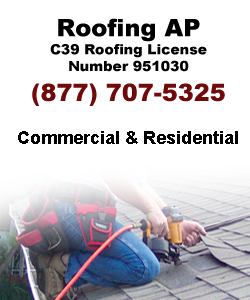 Call AP Roofing! to schedule an inspection of your Heating and Air Conditioning system. We’ll provide you with a detailed analysis of the existing condition.